On 2-12-1682 Henry Somerset, 3.Marquess of Worcester, (1629-1699) was created Duke of Beaufort. 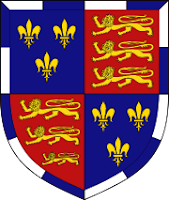 His ancester Charles Somerset, 1.Earl of Worcester since 1-2-1513, was the illegitimate son of Henry Beaufort, 2.Duke of Somerset (1436-1464). His grandfather John Beaufort (ca. 1371-1410), was an illegitimate son of John of Gaunt, Duke of Lancaster, son of Edward III King of England. Thus making the Dukes of Beaufort the male line descendants of the Plantagenet kings of England. They descend from Geoffroy Plantagenet, Count of Anjou, (1113-1151) and Matilda of Normandy, Queen of England. The first known ancestor in the male line is Geoffroi comte de Gâtinais, who was mentioned in 979 and 985/87. 69. Elizabeth Catherine Gubbins * ... + 2-12-1893; Dr van Joseph G.
73. Margaret Cormack * ... + 12-7-1845; Dr van Rev. D. C.
75. Catherine Adeline Welby * ... + ...; Dr van Adlard W.
77. Delia Honoria Lowen * 1818/19 + 9-11-1883; Dr van Pierce L.
94. Sir Gerald Henry Percival de Bathe, 4.Bt. * 1823 + 1907; Zn van Sir William Plunkett de B., 3.Bt. 95. Charlotte Clare * ... + 21-7-1928; Dr van William C.
97. Amelia Pillans * 1796/97 + 23-5-1882; Dr van William Gooch P.
98. Sir Thomas Moncreiffe of that Ilk, 7.Bt. * 9-1-1822 + 15-8-1879; Zn van David M. of that Ilk, 6.Bt., en Helen Mackay = 86. 99. Lady Louise Hay * ... + 4-9-1898; Dr van Thomas Robert H., 11.Earl of Kinnoull, en Louisa Burton Rowley = 87. 107. Anne Craig * ... + 8-3-1869; Dr van Sir James Gibson C., Bt. 117. Anne Jervoise * ... + 24-2-1858; Dr van Sir Samuel Charles J., 1.Bt. 15. Mona Montgomerie Mullins (1909 Midhurst, Sussex -1988) X I 1929 (div?) Major William Frederick Husband, by whom 1 dau (Anne Elizabeth Husband md 1954 Robin Windham Baring 1914-1994, with issue) X II 25.V.1935 (div 1949) Amyas Evelyn Giles Baring. Dau of Col Willoughby Brooking Mullins, Indian Army, of Ambersham House, Midhurst, Sussex.